Whitehall has failed to grasp the potentially devastating impact of corrosive cuts to public spending, the chief of Britain’s spending watchdog has said. This “radical” socio-economic surgery appears misguided and dangerous, he suggested. 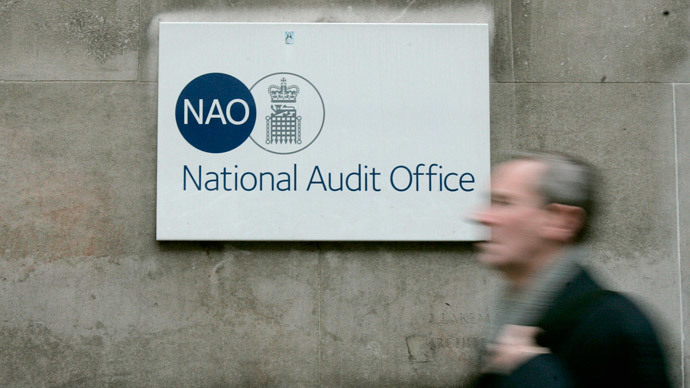 In an exclusive interview with the Financial Times, Sir Amyas Morse, who heads the National Audit Office (NAO), accused government ministers of pursuing irresponsible and ill-thought out economic policies. “If you’re going to do radical surgery it would be nice if you knew where the heart was,” he said. Morse went on to argue that an “optimism bias” had compelled ministers to implement policies, such as NHS reforms, with little debate about their potential risky effects. The NAO chief said civil servants and government officials lack the information and perspective to discern if deep spending cuts benefit the economy or just erode social services. Morse said this problem is particularly evident with respect to cuts to council budgets, which have badly dented social care funding. He also suggested increased pressure on the state’s health service was a serious concern. His sharp critique surfaced two days before Chancellor George Osborne is due to announce his sixth budget. Osborne is expected to soften the depth of cuts in government departments this time round in a bid to improve the Tory’s appeal to voters ahead of May’s general election. Nevertheless, the latest round of spending cuts is an extension of the Tory’s long-term austerity agenda. The Office for Budget Responsibility says the continued austerity drive will see public spending as a percentage of GDP plunge to its lowest level since the 1930s. Under Osborne’s austerity reforms, civil servants have been reluctant to tackle problems or deficiencies associated with such policies, he warned. “What I observed is something that I will collectively describe as the feather game. Because if you keep blowing the feather hopefully it will land on someone else,” he added. Morse said civil servants should not consider themselves unaccountable for problems that emerge in local government. The NAO chief conceded civil servants’ aversion to adding to their responsibilities is understandable to a degree. But he suggested an effort on their part to steer “towards the sound of gunfire, rather than steering away from it,” would be helpful. The Institute for Fiscal Studies warns the chancellor’s planned cuts are “colossal” – set to hit unprotected areas of government spending with a 42 percent blow. This continued austerity will prove catastrophic for an already besieged NHS and intensify the local authority crisis. It will also heap difficulty on military and police services that are buckling, critics say. Others say predicted benefit cuts of £12 billion will ravage low-income families, entrenching inequality in a two-tiered state. Some experts predict Osborne’s latest budget will pave the way for up to a million public service job losses amid a rising tide of poorly paid and precarious agency work. Others suggest the chancellor plans to tweak expected cuts to social spending, challenging the charge he will grind the state’s social fabric down to 1930s levels. The chancellor will devote a considerable proportion of Wednesday’s budget speech to laying out measures a re-elected Tory government would implement post May 7. Among the policy proposals predicted to surface are a further round of welfare cuts and increased inheritance tax relief. The strategy of slashing budget deficits amid sluggish economic growth has been questioned by the International Monetary Fund and many economists worldwide. But Brits will likely face austerity irrespective of who wins May’s general election. But even if the Conservatives lose, political analysts argue the chancellor will still claim a victory of sorts. They stress he has shifted the political compass of debate so far to the right that a Labour government could not abandon austerity in the next parliament even if it wanted to.